For an exquisite home decor and an innovative storage solution, consider this unique jewelry armoire. A long-lasting piece of furniture, manufactured from qualitative wood and specially designed with spacious storage sections to easily fit and organize your entire jewelry collection. In addition, this creative home decor piece has four picture frames with which you can create a lovely display for you and your guests. Available in three different colors for your own home decor, the wooden jewelry armoire with incorporated photo frames is a stunning and unique piece of furniture, specially designed to meet your storage and styling needs and make your dressing corner a special one. You can enjoy and recall your favorite captured moments while accessorizing your outfit at the same time. With European modern design and different sized storage options for your jewelry collection, the wall-mounted jewelry armoire with photo frames can be easily combined with every room’s decor, whether it’s a bedroom, bathroom or a dressing room. This original jewelry cabinet’s convenient and practical 23-3/4″(H) x 12″(W) x 3-3/4″(D) dimensions facilitate relocating or moving processes and, of course, the assembly on the wall. Made out of lost-lasting and qualitative MDF Wood, this original jewelry armoire can hold up to eighteen pairs of earrings, contains twelve necklace hooks, two shelves and, in addition, the entire storage space is covered in black velvet to ensure the best maintenance of your jewelry items, preventing scratches or misplacement. On the outside of the jewelry armoire you will find four picture frames of 5-3/4″(W) x 3-3/4″(H) in size, in which you can insert your favorite photos, creating a lovely display for you while dressing up and for your guests when they come to visit. 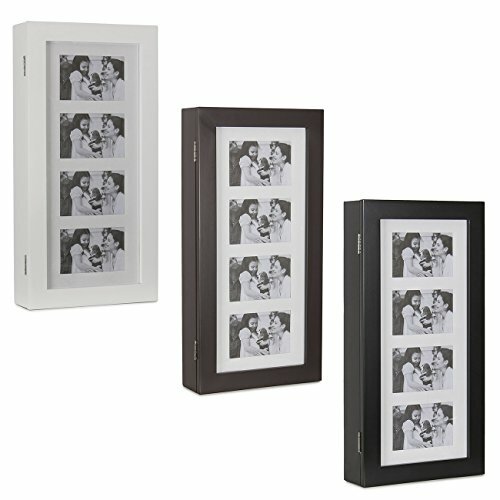 Perfect for the closet, bedroom, or bathroom, it provides fantastic jewelry storage space and an amazing way to help you remember your favorite moments with your loved ones. This unique jewelry armoire, available in black, white and espresso, will become your favorite home decor acquisition, fluffing your jewelry storage needs and creating a joyful atmosphere at your house.